Cookies, especially homemade cookies, make our world a better place. Nothing smells better than cookies baking in the oven. I’m a baker and I can attest to the anticipation and the end result—little bites of deliciousness you can hold in the palm of your hand. It’s a movable feast. Cookies taste good, and eating them makes you feel good. 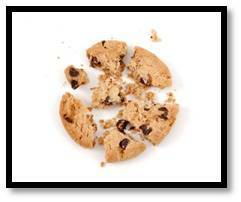 I’ve had a life-long affair with cookies. Ingredients, flavor combinations, even the science behind the recipes fascinate me. Most recipes are straightforward and produce instantly edible results. A homemade cookie turns a bad day around and makes a good day better. Share a cookie, spread the love. There are literally thousands of cookie recipes and just as many variations on them. I have my favorites, and I’m always trying new ones; with a large test kitchen audience I call upon for feedback.In fact, I recently baked my way through a wonderful array of flavors and textures from a book called Big Fat Cookies and there were no disappointments. Small-batch big-cookie baking is a great way to get just enough to taste and share. I reserve some recipes for the Christmas holidays. I’m not sure how it happened, but it’s a tradition that created once-a-year cookies that are worth the wait. Speaking of traditions, I hang with a great group of women who are also bakers. We have an annual Girls Night In Cookie Swap—the polite name for holiday baking throw down—where everyone brings their A game and everyone wins. Despite my baking success with all things cookie, I am intrigued and challenged by the big dog on the porch—chocolate chip cookies. For the past ten years I have researched recipes and experimented with techniques that I hope will deliver the ultimate cookie. There are hundreds of variations on the basic recipe. Some have come very close to perfection, but so far none wear the crown. There are many pretenders to the throne. I’ve never been able to get a chocolate chip cookie to come out exactly the way I think it should. I confess to being my harshest critic. I’m talking about a cookie that’s crisp, buttery, crunchy and deeply darkly chocolate. No chewy cookies, no milk chocolate and definitely no packaged chips. Hand-chopped chocolate with at least 65% cocoa brings just the right balance of sweetness. The cookies must have irregular rippled tops; undertones of butterscotch and toffee and a back note of pure vanilla. It’s heaven in your hand. Butter is where all cookie recipes begin. Anything else compromises flavor and texture. Melting and browning adds even more goodness. Buy the best butter your budget will allow and always use unsalted so you can control the addition of salt as a separate ingredient. In some recipes I have swapped out a bit of butter for a bit of shortening, which gives an edge to the crunch factor and minimizes spreading. Chilling the dough will also prevent the pancake effect. And then there’s sugar. It plays a big role in cookie composition, determining how it looks and tastes. The type and amount of sugar in the recipe gives a cookie its pH, its shape and, to a large degree, its caramelization and crumble factor. Salt is also very important because it balances the favor of the sugars. I am particularly fond of Fleur de Sel. More flour, less flour, cake flour and even bread flour have been combined and touted as the secret to the perfect chocolate chip cookie. I have tried them all and returned to sifted and weighed unbleached white flour. Weighing as opposed to measuring is critical—an incorrect amount severely alters the end result. When it comes to chocolate, I’ve gone to the dark side. A higher percentage of cocoa delivers more intense chocolate flavor and less sugar. Baking chocolate must contain at least 60% cocoa to deliver the chocolate payload. Good chocolate is worth the price, and the best is what tastes bests to you. My personal favorite is Valhrona but I found a pleasant surprise in Trader Joe’s Pound Plus Belgian dark chocolate baking block. A word about nuts. No. They take up space where chocolate should be. In ten years only three finalists have emerged. These recipes produce consistently good cookies that are family favorites. All of them involve more steps than the back-of-the-bag recipe but they are worth the effort. 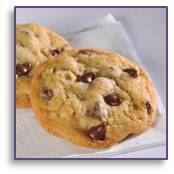 Jacques Torres: This recipe is often called the NY Times chocolate chip cookie, but Jacques is the author. Lots of steps and flour combinations and a 24-hour chill deliver a great cookie. Americas Test Kitchen: The science of baking is reflected in this recipe with a wonderful balance of crunch and flavor. Joy the Baker: Joy introduced me to the browned butter difference and I am forever grateful. You might be wondering if I eat packaged cookies and the answer is yes. I love European store-bought cookies. I never make a trip to a foreign country without visiting the cookie and baking aisles in at least one local grocery store. Not so much for American varieties. They don’t tempt me, but there are two that simply can’t be duplicated in a home kitchen. An Oreo will always be an Oreo and there’s something about a Pepperidge Farm Milano that I can’t resist. 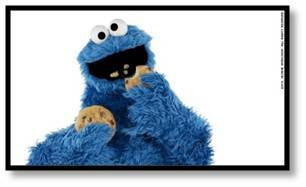 A recent survey revealed that nine out of ten people love cookies. Number ten might be lying. This entry was posted in Food and Cooking, Susanne Skinner and tagged America's Test Kitchen, baking cookies, chocolate chip cookies, Cookie Monster, Jacques Torres, Joy the Baker, Oreo, Pepperidge Farm Milano by A Kaplan. Bookmark the permalink. I can’t wait to try the browned butter trick. But I disagree on the nuts. I think the combination of walnuts and chocolate is sheer heaven. Of course, I also think brownies are a walnut delivery mechanism and pass on nut-free brownies.